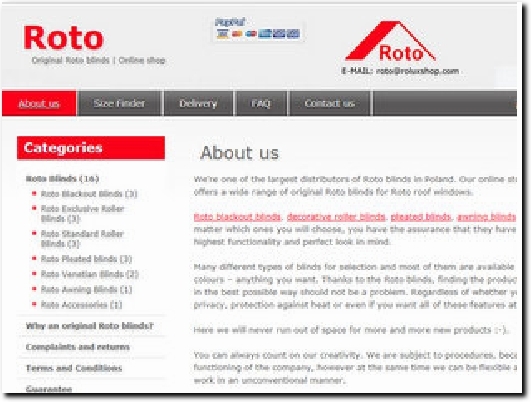 The online store RoluxShop.com is a distributor of original blinds for Roto roof windows. Due to the significant turnover, we buy the blinds for roof windows from producers, with greatly reduced price. The result is that we sell the products in prices interesting for you. Branded Roto blinds are a perfect match for roof windows and are easy to install and operate. This is also a long-term warranty. In the summer, the original Roto blinds reduce the heat in the attic. In the winter time, they increase the windows' insulation and that means great heating savings for you. No matter, if you are looking for decorative solution, if you want to control interior's temperature, or if you need the full blackout of your room, the original blinds for Roto roof windows are a perfect choice. A Polish on-line business supplying and delivering blinds for roof windows throughout the EU. About Us includes the company's postal address and VAT number while Delivery and FAQs answer most questions a customer might have. There is a comprehensive Terms & Conditions section which includes details of the payment cards accepted. The European Commission website is used to settle out of court disputes if needed. Contact Us has an online form for enquiries - phone calls not accepted.